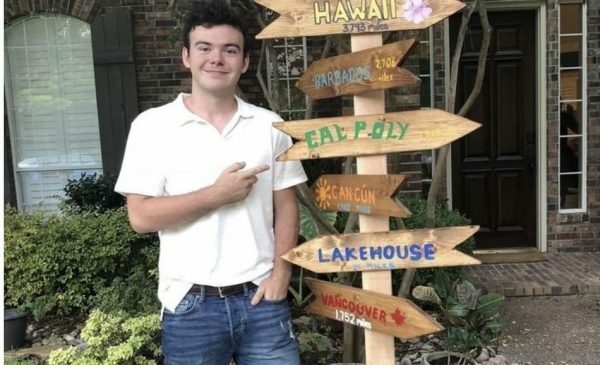 The three caring people surrounding our son, Jordan Grant, as he died on Oct. 7, 2018 at El Campo Road and U.S. Highway 101, all knew not to use this intersection. Chad Robertson, had forbidden his family and all his workers in his construction company from using EL Campo to make left hand turns. Ashley De la Vega, one of the Good Samaritans that tried to save Jordan had also previously committed herself and family to not use this intersection. Michael Freund, the second Good Samaritan, had similar restrictions self imposed at certain times of day due to the inherent danger. So virtually 100 percent of those with Jordan as he died knew about the danger of El Campo and had self-regulated by consciously and voluntarily choosing not to use this route even if it is the more natural route. Think about that. Rich Giuli and Amie Bend did not self-regulate based on the danger of this intersection. Rich was confident. Based on his own statements, he had driven this intersection thousands of times. It was fine. Until it wasn’t. And Jordan was killed by Rich’s unsafe left turn from El Campo into Jordan’s path, southbound on U.S. Highway 101. I have been working with many others hurt at El Campo to stop these left hand turns. We have gathered over 27,000 petition signatures and thousands of comments supporting making this change. We have been opposed by some that think they are good drivers and that accidents happen to bad drivers, not them. Maybe Rich Giuli thought he was part of this good drivers group prior to running over Jordan. We have been opposed by some who want an overpass and believe that dream will never be realized if the intersection is closed, even partially. Regardless of such hopes and dreams, I insist that the intersection be made safe as quickly as possible to save the next Jordan. That Jordan could be your child, your grandchild, your spouse, your sibling, your parent. Our loss is immeasurable and we bear it every single moment of every single day and know we will do so until we too pass from this earth. Please understand we deeply desire to save you and yours from this permanent unfixable soul rendering pain. I argue that a partial closure and overpass are not mutually exclusive. I fully intend to ask that an acceleration lane for right hand turns to be built as it is also insanity to take a 90 degree right hand turn in front of freeway speed traffic. I also intend to argue that an overpass is needed, not in the long-term, but in the medium term ( five years). But we cannot afford to wait on public safety while these efforts to get an overpass built are underway. Since 2000, Jordan’s entire 18 year lifespan, so many people have been injured, maimed and killed at these unsafe crossings like El Campo, all while waiting for an overpass. We cannot wait any longer. As a community we have the duty, funds and knowledge to take immediate action to remedy the dangerous US 101 crossings like El Campo. We now have two traffic studies, one in 2008 and the new one just prepared, that conclude the left hand turns should be stopped as they cause severe broadside traffic collisions. So let’s fix the problem and aggressively work together on getting an overpass built. Both need to be done, in that order. To get an overpass built I believe there is a role for a public/private partnership starting in the planning phase. Becky and I have committed $100,000 towards this effort as long as local landowners that will benefit from an overpass join us in this effort. By so doing I would hope to accelerate the overpass build process that we are told takes at least 12 years from today, to five years. The actual demand for an overpass is much, much greater than shows in the current traffic numbers. Traffic studies performed to date would need to correct for current errors in the engineering data. The problem is up to now the actual traffic on El Campo has been counted. It is low. But what hasn’t been captured are the thousands of people who have self-regulated due to the El Campo danger and choose to take a different route. Like Chad, Ashley and Michael. I believe a properly designed overpass is justified in the medium term and will return normal traffic levels to this area from those that have self-regulated away. By so doing, I expect that many of Arroyo Grande’s currently impacted intersections will be partially relieved from their current congestion. So while both I and the Traffic Assessment argue in support of closure of unsafe left hand turns, we cannot just stop there, but need to continue until an overpass is built. No, we don’t all want an overpass. Many of us feel that only allows Caren and Co. to pave all of south AG and stuff it with more ticky tacky houses and their from-the-city residents. The proposals embraced by Mr. James Grant make sense, and I believe Mr. Grant has the betterment of our community in mind, unlike the failed Caren Ray Rossum. Ray-Rossum played politics with the El Campo issue, and I think most observers know by now that she is not credible in public policy matters. Sadly, Caren ray Rossum used the Grant family tragedy in the run-up to the 2018 AG mayor’s race, and she turned her back on Jordan and the Grant’s after getting elected. The leftist progressives have no moral compass, and they are a cancer on the body politic, so voters ought to reject their political ploys. I have a question. It is not intended to be callous, and I think it is a valid question. How fast was Jordan travelling at the time of the accident?